476 pages | 32 B/W Illus. While a decade ago much of the discussion of new media in Asia was couched in Occidental notions of Asia as a "default setting" for technology in the future, today we are seeing a much more complex picture of contesting new media practices and production. As "new media" becomes increasingly an everyday reality for young and old across Asia through smartphones and associated devices, boundaries between art, new media, and the everyday are transformed. This Handbook addresses the historical, social, cultural, political, philosophical, artistic and economic dimensions of the region’s new media. Through an interdisciplinary revision of both "new media" and "Asia" the contributors provide new insights into the complex and contesting terrains of both notions. 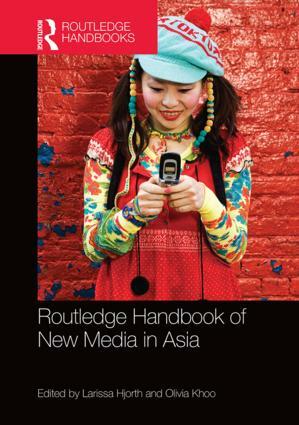 The Routledge Handbook of New Media in Asia will be the definitive publication for readers interested in comprehending all the various aspects of new media in Asia. It provides an authoritative, up-to-date, intellectually broad, conceptually cutting-edge guide to the important aspects of new media in the region — as the first point of consultation for researchers, advanced level undergraduate and postgraduate students in fields of new media and Asian studies. Larissa Hjorth is an artist, digital ethnographer and Professor in the Games Programs, and codirector of RMIT’s Digital Ethnography Research Centre (DERC), Melbourne, Australia. Olivia Khoo is Senior Lecturer in Film and Screen Studies at Monash University, Australia.